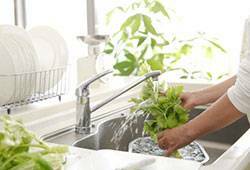 Clean up your act with an elegant kitchen sink. Our exclusive selection of contemporary kitchen sinks is available in thick, robust stainless steel and classic white ceramic. The sink is a focal point of any kitchen, so give your kitchen a stylish, modern look with a show stopping stainless steel or ceramic KuKoo kitchen sink. Functional, affordable and reliable, our range of contemporary stainless steel sinks provide catering standard quality for your home kitchen and feature a practical one and a half bowl layout. MonsterShop kitchen sinks come complete with one of our sophisticated taps. We offer mega-fast free UK delivery on all kitchen sinks, and if that’s not quick enough, you can collect your order from our warehouse in York, North Yorkshire.